Greg Holland hung a slider to Eric Hosmer. Of all the people who should know better, you’d think it would be Holland. But on a 1-1 count with two down in the ninth, Holland spun a spinner that Hosmer LAUNCHED (no other word for it, that thing was at 109 mph off the bat) for a three-run walk-off blast to clinch the series for Kansas City. I don’t think anyone knew quite how to act when Holland entered the contest. High leverage, lots in the balance and hey, here’s a beloved franchise icon wearing a different uniform trying to shut down the top of the lineup. I think this is why Rex’s folksy colloquialism button malfunctioned; he could barely eke out a “Look at those walk numbers!” before Holland was in and walking Alex Gordon. It was obvious that Holland wasn’t quite Hollandy (Hollandish? Hollandaise? Now I’m hungry)—Whit Merrifield and Lorenzo Cain hit rockets off him for outs, with Raimel Tapia hauling in Merrifield’s on a dead-run. 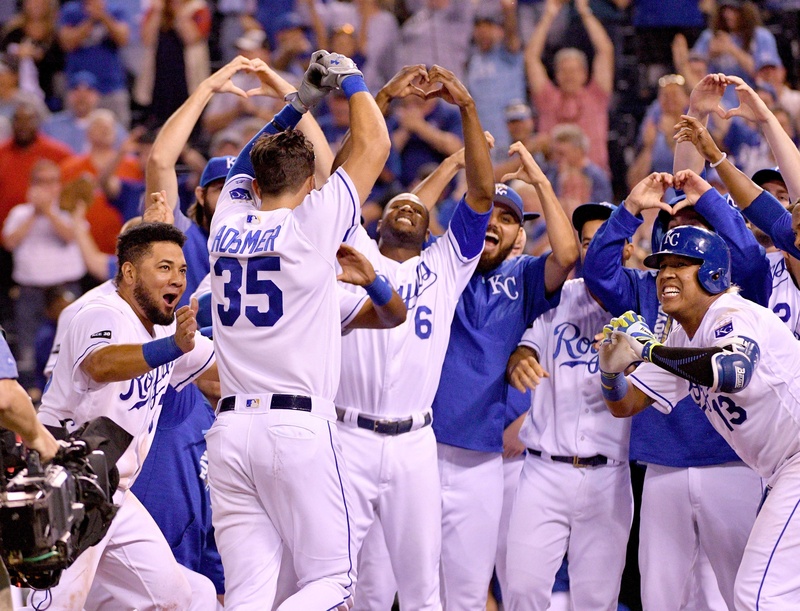 Then Melky Cabrera singled, Hosmer homered and everybody danced out of Kauffman Stadium. That erases most of the memories of a(nother) subpar Ian Kennedy outing—he couldn’t make it out of the fifth inning, giving up seven hits and three earned and left the bases loaded for Ryan Buchter, but not before also allowing home runs to Nolan Arenado in the first and Charlie Blackmon in the third. Not an amazing look for a guy trying not to surrender 30 homers for the third straight season. But you know did have a good night? One Whitley David Merrifield, who became #FourHitWhit for the third time in 2017. Did you know he started the regular season in Triple-A so Raul Mondesi Jr. could hit a toddler’s body weight for a few weeks? Frankly, I feel like that be one of the first things mentioned whenever Dayton Moore retires. The Palmetto State Assassin had a hand in the first three runs for the Royals. In the second, Merrifield drove in Mike Moustakas with his second single. In the fifth, Cain’s 23rd double scored a hard-charging Merrifield from first after his leadoff single. In the seventh, another Merrifield leadoff single—and subsequent stolen base, his season’s 24th—was brought home to roost on a Hosmer single. I wish there was more to report, but Merrifield and Hosmer accounted for half of Kansas City’s runs and all but one of the Royals RBI. Salvador Perez was 0-for-4 with two strikeouts and enough grimaces that I really am less happy than I should be after a thrilling walk-off win. A final note to leave you on. The Royals already have the series—Thursday afternoon, Jake Junis attempts to give Kansas City the sweep opposite German Marquez.